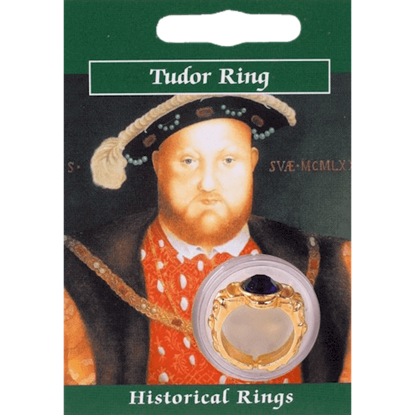 We offer an excellent array of Tudor jewelry inspired by the historical dynasty of Henry VIII, Queen Elizabeth I, Queen Mary I, and other distinguished rulers. 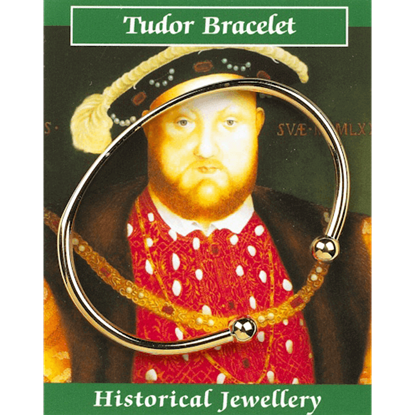 We carry Tudor necklaces, Tudor earrings, Tudor rings, Tudor bracelets, and Tudor pendants inspired by the symbols and styles of these royals. Certain designs display the iconic Tudor rose, while others show the royal seal and historical coins. 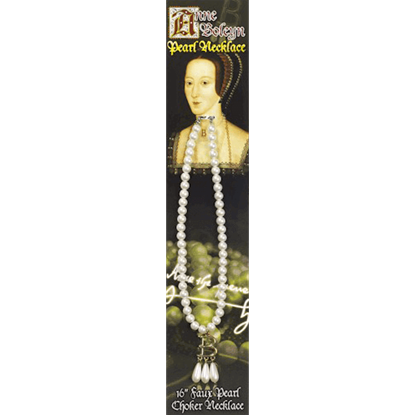 We carry Tudor pearl jewelry, as well as pieces decorated with colorful crystals. Crafted from fine pewter and plated with gold or given an antique finish, these Renaissance jewelry items are sure to impress with their attention to detail. Whether you are dressing up for the fair, a theatrical performance, or a costume party, this historical jewelry makes a fantastic finishing touch. Queen Elizabeth I, who ruled for 44 years, ushered in a new era of thriving arts and prosperity known as the Elizabethan era. 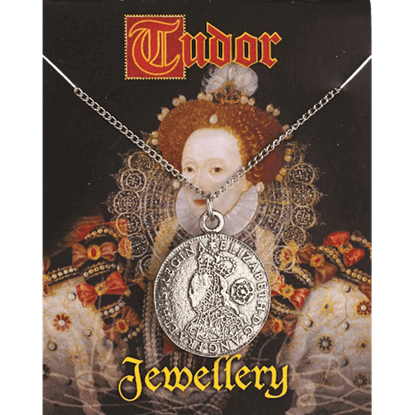 The Elizabeth I Coin Necklace displays a piece of Tudor currency inspired by the coinage of her reign. 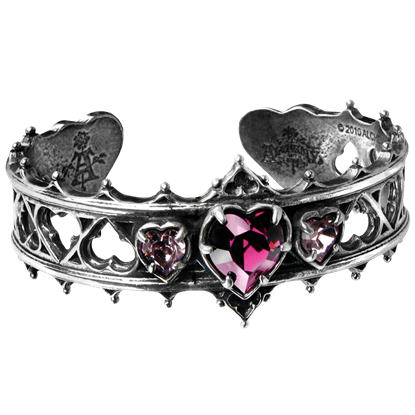 Romantic and gothic all at once, this Elizabethan Bracelet combines fine pewter and glimmering crystal into a cuff style bracelet. The trio of amethystine accents only helps to enhance its appealing and eye-catching design. The lovely Elizabethan Cross Earrings feature an ornate design inspired by the original motif of the decorative molding above the north entrance to the 16th century Kenilworth Castle of Robert Dudley, the Earl of Leicester. 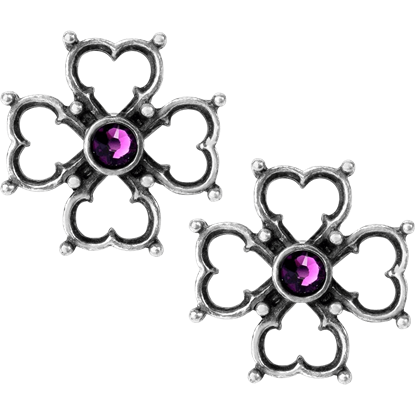 A symbol of a condemned and secret love from the age of Shakespeare, these earrings offer a charming design for modern looks as well. 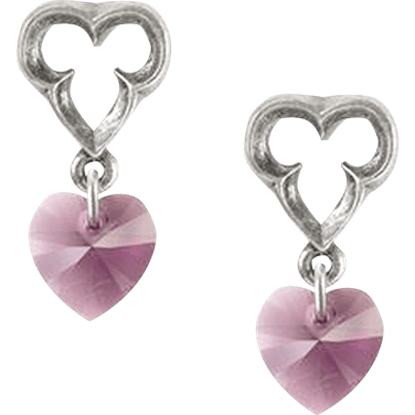 The Elizabethan Heart Earrings suspend amethyst Swarovski heart crystals from their design. 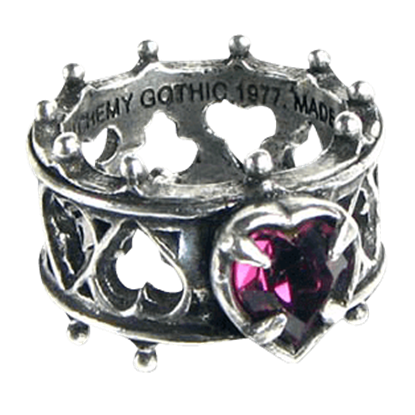 The Elizabethan Ring replicates Lord Dudleys lost sign of devotion. An advantage of this pewter Elizabethan ring is that it does not need regular polishing to maintain its gorgeous appearance since it does not tarnish like silver. 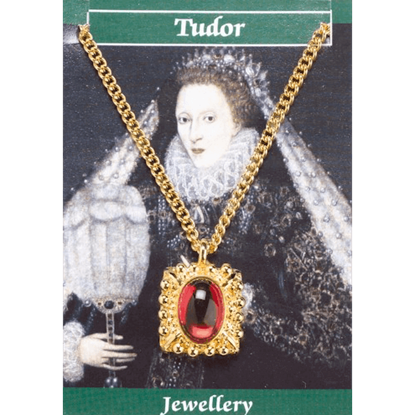 This Elizabeth I Gem Pendant is made from 22ct gold plated lead-free pewter with a blue or red gem and is supplied on gold plated chain. The information card is full color on the front and has historical information on the reverse. Queens have always wanted the best of jewelry, and this Gold Plated Elizabeth I Gem Ring is a reproduction of the ring worn by Queen Elizabeth the First. It comes in a blister pack attached to a card with historical information. 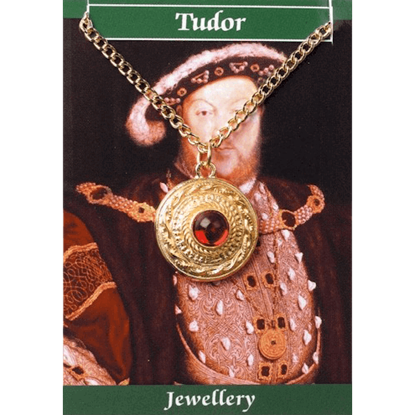 This Henry VIII Gem Pendant is made from 22ct gold plated lead-free pewter with a blue or red gem and is supplied on gold plated chain. The information card is full color on the front and has historical information on the reverse. With an opulent look that is best fit for a king, this Gold Plated Henry VIII Gem Ring is a great accessory modeled after the jewelry of an infamous English monarch. The ring comes in a blister pack attached to an information card. 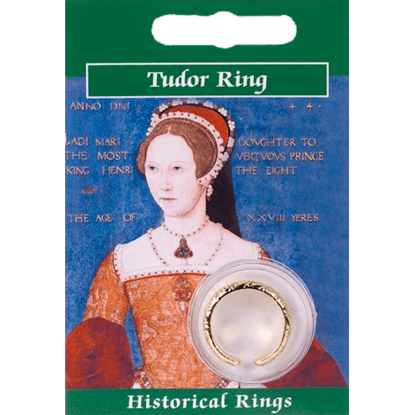 This ring is a replica of one of the simple yet stunning finger rings worn by Mary I, also known as Bloody Mary. 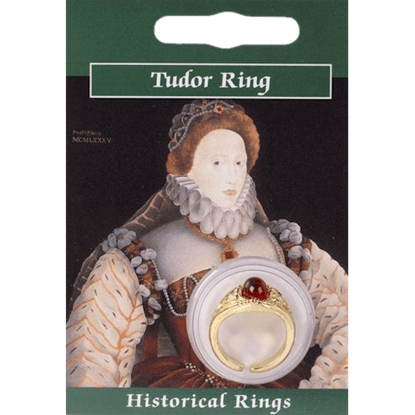 The Gold Plated Mary I Love Ring comes packaged in a plastic blister, attached to a full-color card with historical info. Bracelets have remained a staple in fashion since their creation. This Gold Plated Tudor Bracelet is an elegant and uncomplicated bracelet, one that would have been worn throughout the centuries in England thanks to its look and style. You have some great things on your website and they are very realistic, and your customer service is excellent! So I am planning on returning for future purchases. You guys are great.